Mrs. Rhue received her Bachelor of Arts Degree from Johnson C. Smith University in Telecommunication/Journalism and her Master of Library and Information Studies from the University of North Carolina at Greensboro. 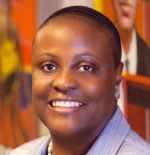 Mrs. Rhue was a recipient of the ACRL Harvard Leadership Institute Scholarship (August 3-8, 2008), and a participant of the HBCU Library Alliance Leadership Institute. (April 4-8, 2008). Mrs. Rhue is also the proud owner of Preserve Pro (www.preserveproinc.net), North Carolina’s first African American Archives Consulting business.